coffee | Chaz' journey back. I never know where the next lesson in life will come from. Today’s was from my coffee maker that occasionally malfunctions by letting grounds clog up the drip passage then overflow onto the counter. Sometimes, like this morning, I switch the coffee maker on and go attend to other tasks in a different room. Unknowingly leaving the pot to overflow onto the counter, into the drawers and cupboards below, and all over the floor. When I discover the mess, which of course then alters my morning routine considerably, I find the first place my mind goes is blame. “If Procter-Silex could only build a reliable coffee maker! Inept bastards”! Or get agitated at my family for having chosen the drawer beneath the coffee maker as the stationary drawer for the household, which of course now is all stained by spilled coffee. Then come the mental images of hurling the coffee pot at the wall to show how unjustly I have just been treated by Procter-Silex, my family, Maxwell House, and of course the coffee pot itself. Then, thankfully, only seconds later, I catch myself. How is it anyone’s fault? Does this sort of thing not just happen from time to time in any of our lives? And how long really will it take to clean it up? 5 minutes at best? Can I not do that? Am I prepared to surrender my serenity over spilled coffee? Will I even remember this mishap in a month, a year, 10 years from now? I then proceeded to ask myself, “Instead of feeding my anger, what small thing can I do right now to improve this situation”? To which I answer, “Unplug the coffee maker and put it in the sink for cleaning”. So I do, and what happens? Life is immediately much better. In fact, gratitude begins to well up that I do have a coffee pot and sink, and this mishap isn’t sending me into a rage or out drinking. Gratitude begins to displace anger and I begin to laugh. 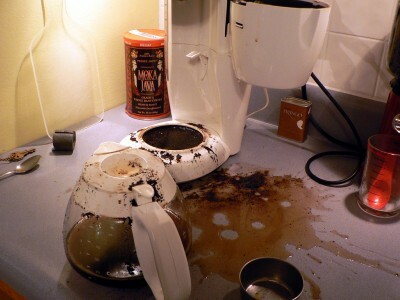 It wasn’t 5 minutes before the entire mess is cleaned and a fresh pot of coffee is now brewing. And best of all, I have this clear image of how blessed I am to have recovered to the point where these little incidents don’t send me around the bend anymore. And that lights come on quickly that expose the unrecovered parts of my thinking, the ones that tried to immediately blame and self-pity over the malfunctioned coffee pot. And let me tell you, the first cup from the next pot of fresh brew was amazing! Simple, unexpected signposts in life that tell me I am on a better path than I was before. And deep feelings of gratitude that show themselves in new behaviours and thinking patterns. And the icing on the cake, joy and serenity return within moments. Life is way better on the path of recovery.